The main feature here at DerbyListing.com is the list of roller derby leagues. It’s been quite a bit of work and a lot of fun to put this together. I hope you find it useful and enjoyable. A few tips on how to use the list. If you have any questions on usage, feel free to post them in the comments. Filtering: There is a filter box at the top of each column. The text you enter into a box will filter the list by that column. Example 1: if you want to see all of the “A“dult “W“omen’s leagues. Enter “A” in the AGES column, then Enter “W” in the GENDERS column. Example 2: Let’s say you want to see a list of all the roller derby teams in the Bío Bío region of Argentina. Enter “Argentina” in the COUNTRY column, then enter “Bío Bío” in the REGION column. Or you could skip filtering the country and just enter the region. Adding Leagues: If you know of a new league that isn’t on the list, you can click on the Add New League button. Enter the appropriate information in the boxes, then click the Submit button. The information will be verified and approved prior to appearance on the list. Updating Leagues: If you see something incorrect about a league, you can click on the league you want to edit, then click on the Edit Selected League button. Enter the appropriate information in the boxes, then click the Submit button. The information will be verified and approved prior to appearance on the list. To Report a league as inactive, click on the league you want to report as inactive, then click on the Edit Selected League button. Enter a date in the LEAGUE END DATE box, then click the Submit button. Exporting the List: Click on the Export List to Excel button and you will be prompted to save a file to your computer. This functionality does not work with Internet Explorer. If you want the file, I recommend using Chrome, Firefox, or Safari. If you filter the list prior to exporting, it will only export the filtered list. I first started compiling this data because I was looking for an accurate count of roller derby leagues. The main resource at the time was a wonderful website that you may be familiar with… Derby Roster. I can’t count the number of times I referred to Derby Roster prior to putting together my own list. I started to notice that some of the leagues listed were, in fact, disbanded. As I encountered more of the disbanded leagues, I decided to compile my own list. I meticulously checked each league’s website or Facebook page to determine if they were still active. Once I had winnowed the list down to just the active ones, I set out to search for any other active leagues that might have been missed. I used data from several sites to help find missing leagues. Unfortunately, I kept encountering the same problem. Leagues that had disbanded, but that were listed as active. Ultimately, I settled on using Google, Facebook, and country-specific lists to find new leagues. Even the country-specific lists had disbanded leagues listed. Unfortunately, many lists are buried in Facebook groups or obscure blogs. (And if anyone knows of an accurate and up to date list for Mexico… I’m all ears.) As I gathered more of these resources, I felt confident that my list was the most up to date and accurate survey of roller derby leagues in the world. The final tricky bit is maintaining the list to weed out any leagues that have disbanded. Unfortunately, I can’t simply rely on leagues to inform everyone that they are no longer active. My current method relies heavily on Facebook. Using the Facebook API, I check each leagues Facebook Page for the most recent post. If the post is within the last three months, the league is kept active. If the post is older than three months, I contact the league to see if they are still active. If there is no response, I assume the league is inactive. If there is a response, I use the information provided to determine whether the league is active. There are some downsides to using Facebook for this. The main one is that not all leagues use Facebook. Additionally, there is a subset of leagues that are on Facebook but don’t have Facebook Pages. However, for the handful of leagues that don’t use Facebook Pages, it’s usually not too difficult to contact them directly for information. I hope now that the list is up and running I will be able to crowdsource the data, but I’ll always fall back to the old tried true methods just to make sure. Cover Photo: That super awesome photo comes to us from Chris Bojanower who is based in Utah. Logo: That sweet, sweet logo comes to us from Taela Yaletchko who is a skater with Jet City. I am Richard Hurton. Well, that’s my current derby name, at least. I first heard about the resurgence of roller derby around 2003 via the Comedy Central show Insomniac with Dave Attell. I honestly didn’t think much of it. Looked like fun, but there wasn’t any roller derby in my town so I promptly forgot about it. Then in 2006 my partner and I moved to the MidWest. She had reconnected with a highschool friend (thanks, Facebook) who conveniently lived at the half way point for the cross country move. I only mention this friend, because she was gung ho for roller derby, and was a skater on her local team. It got my partner excited to learn more about roller derby. Unfortunately, the small town we moved to didn’t have roller derby… so after a short while, I forgot all about it… again. In 2009 we found ourselves moving again. This time to Salt Lake City. Prior to moving I had made contact with a person in SLC via LiveJournal (oh how I miss LiveJournal). She and her partner just happened to be the announcers for the local roller derby team (Salt City Derby Girls). Through them we finally made it to our first derby bout! A little late to the party, but at least we made it. We went to a few more bouts, but 2009 was a tumultuous year for roller derby in Salt Lake City. The local league split. Out of that split emerged Wasatch Roller Derby (WRD). Alongside WRD a recreational league started, The Red Rockettes. By coincidence one of the founders of the rec league happened to be one of the first people we met in Salt Lake City. In 2010/2011 my partner decided that she would give recreational roller derby a go. I, in full support of my partner, volunteered to NSO. And thus began our deep dive into roller derby. My original roller derby name was Unkle Sammich. Later, I decided to complement my partner’s derby name, Liz Tailher; so I changed my derby name to Richard Hurton. If you still don’t get the connection, google “Elizabeth Taylor and Richard Burton”. In 2012 I started researching derby leagues around the world. I wanted to get a better idea of how many leagues played under the different rulesets. That research eventually resulted in this website. A note on the codes used in the list. There are several rulesets used in modern roller derby. While the WFTDA ruleset is the most popular, the other options have a solid core of fans. Many skaters are rules-agnostic and are happy play under any rules. Therefore, I try to cover all the rulesets here at DerbyListing.com. Affiliation is based on membership with an association or organization. These organizations tend to act as governing bodies for a given ruleset. In order for this affiliation to be used in the list, the the affiliation must be published by the organization. For example, WFTDA publishes a list of member and apprentice leagues. Currently only WFTDA, MRDA, and JRDA publish membership information. There is currently one exception to the member organization type of affiliation. School-based leagues. There is no common member organization as with the others, but it was pointed out by a user of the list that it would be useful to be able to find such leagues more easily. I fully understand that gender isn’t binary, Male vs Female or Men vs Women. That said, in order to keep things simple some concessions must be made. I’ve chosen to use three codes for Gender (W, M, C). I’m also making a distinction that Gender is Team-based not League-based. For example, a League can have a Women’s team, a Men’s team, and a Co-Ed team. In such a case, all three gender codes would appear in that League’s entry. For those that are not familiar with the term Co-Ed. It comes from Co-Educational and, at least in American English, it has come to refer to any group that has both Men and Women. W: Women. This is for teams that primarily identify as being for women. It includes Juniors teams for young women. M: Men. This is for teams that primarily identify as being for men. It includes Juniors teams for young men. C: Co-Ed. This is for teams that actively call out that they are Co-Ed. It includes Co-Ed Junior teams. Ages are simple. There is Adult and Junior. That said, there is some variation on the definition of “Adult” in the rulesets noted above. For example, USARS considers 16 years of age to be Adult while WFTDA considers 18 years of age to be Adult. A: Adult. Generally speaking adult teams have players that are 18 years of age and older. J: Junior. Generally speaking junior teams have players that are under 18 years of age. For our purposes all Leagues listed should be ACTIVE. Here the term STATUS refers to the stage of development the league is at. RECRUITING: New Leagues that are recruiting, but have not yet started regular training. PRACTICING: Leagues that have started regular training, but have not yet started regular scrimmaging. SCRIMMAGING: Leagues that have started regular scrimmaging, but have not yet started bouting/competing. BOUTING: Leagues that are playing games regularly. Yes, I realize that WFTDA no longer uses the term Bout to describe a game of roller derby. Please understand that this list covers all rulesets, and that Bout is the commonly used term for a game of roller derby, even among WFTDA leagues. One of the slightly confusing things about roller derby is the use of of the term League instead of Team. In most sports a League is an organization that stands above individual Teams, and is often thought of as being in control of rules making and game scheduling. However, in roller derby the term League has been appropriated to mean something slightly different. It all goes back to the revival of modern roller derby. The first group that kicked everything off created a structure that would be copied by many. They created four Teams to play against each other. All four Teams were owned by the group so they, in essence, formed a League. Since they were the only roller derby group in existence, they were also the only League in existence. 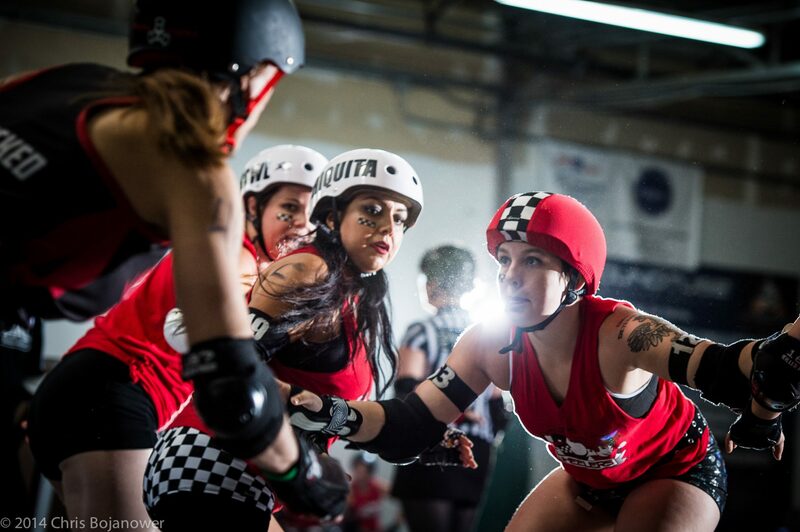 As roller derby grew, and new groups formed, many of them mimicked the four team structure. The result was a bunch of tiny four team Leagues. This wasn’t an issue at first because Leagues didn’t really compete against each other. However, as we all know, Leagues started to play against each other. And even though many Leagues might still have the old four Team structure, they also have what is now known as an All-Star, “A”, or Travel Team. This is usually the team that plays against other Leagues. As roller derby has spread, we now see some Leagues have abandoned the original four Team structure. Instead, they only have one Team. Are these groups supposed to be referred to as Team or League? For the purposes of this list, each group, no matter how small, is considered to be a League. Even if the group has only one Team. At this point we’re stuck with the oddball usage of League. It’s roller derby… just keep on rolling with it. One of the main ways I confirm whether a league is active is via their activity on social media, primarily Facebook. If it was feasible, I would contact every league and have them confirm that they are active. That would be a full-time job by itself. I already have a full-time job, and a life that partially revolves around derby, so I have to find other ways to keep tabs on leagues. The best way I’ve found is to go where the leagues are. Right now, that place happens to be Facebook. Yes, some leagues have their own websites. And some leagues use Twitter. There are even some leagues that have a Tumblr. Heck, if you dig deep enough you can find leagues with a MySpace account. But Facebook appears to have become the standard place for leagues to post about their public events, happenings, and news. In the interest of making life easier for the leagues, the fans, and (to be completely honest) this website… here are some tips on how to best use social media and other communications platforms. This post will focus on Facebook. I hope to cover other topics in future posts. One of the biggest mistakes leagues make when using Facebook is in restricting who can see what they post. This usually starts out with a private Facebook Group, or a non-public personal Facebook Profile, or a restricted Facebook Page. Yes, that’s three different ways that people interact with Facebook… and three different ways in which people might fail to communicate properly with their fans. Let’s tackle each one individually. Facebook Profiles are the bread and butter of Facebook. I have a Profile, you have a Profile, your friends and families have Profiles. It’s the way most people interact with Facebook. You post something to your Profile, and your friends can see it on their Wall. I’m mentioning personal profiles because this is a fairly common mistake made by leagues. Sometimes a league will create one of these personal profiles as a way to communicate with those interested in the league. This is a huge mistake. Never create a Profile for your league. Here’s why. The profile is limited to 5000 “friends”. That may seem like a lot, but there are Leagues with well over 5000 fans. Do you want your league to be limited in this way? You have to manually approve each friend. Do you really want to manually approve each person that wants to be a fan of your league? That seems like an onerous task you’ve set for yourself. Your “friends” can post directly to your Wall. There are settings to avoid this, but by default, you could have up to 5000 people cluttering up your Wall with all sorts of inane and inappropriate posts. Your profile isn’t entirely public. So when people try to search for it, they may not find you easily. I can’t say this often enough. Never create a Facebook Profile for your league. There are other, better options which we will explore next. Facebook Groups are a great way to communicate with a like-minded set of people. They can definitely be handy in helping you with communication for your league, but as with Profiles, some Leagues make mistakes with Groups. First let’s talk about what makes a Facebook Group special. Groups can either be Private or Public. As you can probably guess, a Private group is only visible to the group members. A Public Group is visible to non-members. Groups allow you to approve membership in the group. Whether the group is Public or Private, Facebook Groups allow you to control who has access to the Group. In a Private Group, this allows you control who can see any of the Group posts. In a Public Group, this allows you to control who can post to the Group. One major issue with the Privacy settings of Groups is that you have to be extra careful how Private you make the group at the outset. If you start a group as Private, you may not ever be able to make it Public if the group grows too large (greater than 250 members). When should you use a Group? When you have a smallish group of people (less than 250). For example, just the skaters, officials, and volunteers in your league. When you have a need for privacy and control of the group members. For example, you have a private group discussing league committee assignments and issues. You may not want that info available to the public. When you have a need for an ongoing dialog with anyone interested in a given topic. This doesn’t necessarily fit for a league, but to give an example let’s say you want to create a group that is less about your league and more about a certain topic. For example, Roller Derby in Argentina. Create a Public group. When shouldn’t you use a Group? When you want to communicate with your fans. Groups are a poor way to communicate with your fans as they require your fans to jump through membership hoops. If you want to communicate with your fans on Facebook, you would be better off creating a Page. When you want to control what appears on your League’s Wall. Groups allow anyone that is a member to post to the Wall. If you want tighter control of what appears on your Wall, you’ll want a Page. When you have dreams of having thousands of fans. Profiles max out at 5000 friends. Groups have no max, but there are restrictions after you hit 250 members. Pages have no real maximums. They’re the best option for generating a fan base. When you have some static information that you want to make sure everyone sees about your league. While Groups do have an “About” section, it’s not nearly as robust as the “About” options found in Pages. We’ve finally made it to Facebook Pages. This is really the best option for most leagues. Your main communication to fans should be through your Facebook Page. Here are a few reasons why Facebook Pages are so great. Likes vs Friends. Fans can simply Like your Page. No hassles about membership for your fans means that you can get more fans in the process. In addition to this, you don’t have the hassle of approving every friend or group member. Additionally there are fewer restrictions on the number of people that can like your Page. About. The About section of the Facebook Page is a great place to store static information about your league. Stuff like email addresses, recruiting info, practice locations, etc. Your Posts Only. Facebook Pages feature your league’s posts, not someone else that might post to the Wall. Those other posts still appear, but they aren’t immediately visible the way they might be on a Profile or Group. Roles. Do you have multiple people that need to be able to post to the Page? You can assign the appropriate Role to each person, and now you don’t have to worry about sharing passwords. Public. Facebook Pages are public by default. They are also easy to find via Google and other search engines. I can’t overstate how important this is. Having multiple ways for people to find your league is the difference between having a few fans and having thousands of fans. I should note one thing here. If you set Age or Country restrictions on your Page, it will not be searchable anymore. Do NOT do this. Is the answer always a Facebook Page? It might seem like I’m biased about Facebook Pages, and that’s because I am. They really are the best option for your league to communicate with your fans on Facebook, and since they are public, they can also be used to communicate with people that are not on Facebook at all. That said, I don’t want you come away thinking that all you need is a single Facebook Page. They’re powerful, but they won’t fill every single need you might have. For example, internal communication within your league shouldn’t happen on a Facebook Page. It should probably happen on a private e-mail list or in a Private Facebook Group. Some leagues even go as far as setting up custom private forums. If you’re just starting out and organizing a new league, a Public Facebook Group is a great way to get things off the ground. Your conversations are public, but controlling the membership of the Group can help you build a tighter community around your new league. At some point though, you should really consider creating a Facebook Page to communicate with the rest of the world. In the next Derby Tips post, we’ll discuss a few more things about using Facebook, and we’ll move on to a couple of other Social Media platforms.